hopefully this question gets a response. 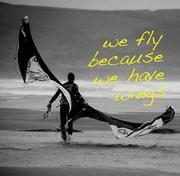 I know there are more then a few of you out there who have experience kiteboarding so . . .
but I don't think the size would be the same on dirt as on water, so can someone offer some advice? seems like there is likely a rule of thumb, such as add 2 sq meters for whatever the recommended water sizes are? My curiosity was sparked because while I was interested in a dirt windboard I saw the cheap kite online that wouldn't set me back too far. looking at the previous chart I'd think that would be too small for anything except an rc car, but then why would they sell it? I'm 145lb and would be thinking about the 25-30mph winds, although we get wind storms here every few years, last one had 73mph winds. Most of the time, I use my 10m² kite for kite-mountainboarding on a flat beach (with hard sand). And a 6m² kite when the wind is strong. Sometime I ride with a large 15m2, in low wind conditions (85 kg, and a Comp MBS board 8"). When you need 12m2 on water , you can ride with 6 or 10 on a flat ground. so it takes less area on flat ground then in the water, that is the opposite from what I was thinking, thank you. Christian wrote: Most of the time, I use my 10m² kite for kite-mountainboarding on a flat beach (with hard sand). So for you're larger kite vs smaller, what wind range do you usually fly each? Strong wind vs Light wind? Mph? it depends on the size of the kite..
Cerchi la migliore piastra per capelli professionale?